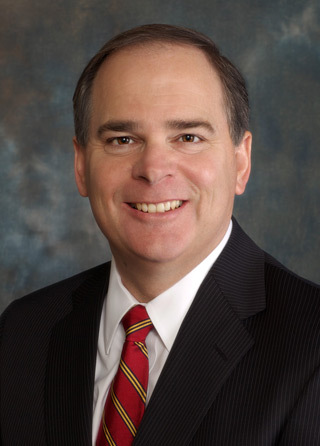 Nicholas K. Akins is considered the 10th president and sixth chief executive officer for American Electric Power and its predecessor, American Gas & Electric (AGE), over the company’s 104-plus year history. Prior to the early 1960s, there was no position at AEP specifically named chief executive officer. After AGE was incorporated on Dec. 20, 1906, a number of individuals shared leadership of the new company. Millard Humstone was elected president and Brigham Curtis was named chairman of the board. They held their respective positions on an interim basis for 25 days, then resigned. Permanent officers were elected Jan. 15, 1907. From 1907 to 1910, AGE was led by the triumvirate of Henry L. Doherty (1870-1939), Sidney Z. Mitchell (1862-1944) and Richard E. Breed (1866-1926). Mitchell was in charge of financing, Doherty handled engineering and operations, and Breed was responsible for the company’s franchising. 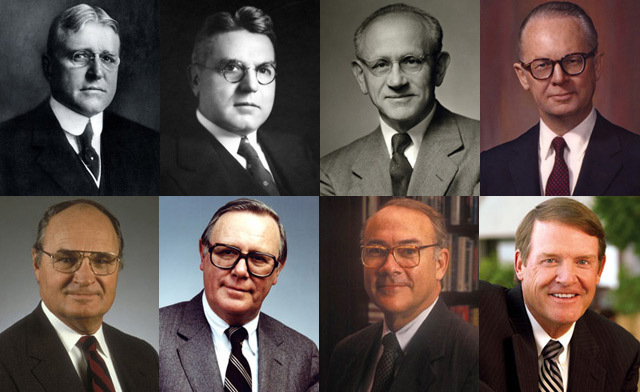 AEP's top leadership over the years (top row, left to right): Richard Breed, George Tidd, Philip Sporn, Donald Cook; (bottom row, left to right): Pete White, Richard Disbrow, Linn Draper, Mike Morris. Breed then became president from 1910 to 1923, and was chairman from 1923 to 1926. In 1923, George N. Tidd (1874-1952) took over as president until his tenure ended in 1947; he was chairman from 1947 to 1949. Philip Sporn (1896-1978) succeeded Tidd as president from 1947 to 1961. Although he served in many other leadership capacities as well, the chairman’s position had been shelved after Tidd’s tenure, and the CEO position did not then exist. Donald C. Cook (1909-1981) was the first person officially elected as chief executive officer. He became president and chief executive officer of the company in 1961, retaining the position of president until 1972 (he was president and chairman from 1971 to 1972, and chairman only until 1976). George V. Patterson (1912-1993) was president from 1972 to 1977. W.S. “Pete” White Jr. (b. 1926) served as chairman and CEO from 1976 to 1991; he continued as chairman until 1992. Richard E. Disbrow (1930-1996) was elected president of the company in 1979; he was named president and CEO in 1991, and was named chairman and CEO in 1992. Dr. E. Linn Draper, Jr. (b. 1942), became president in 1992, and succeeded Disbrow as chairman and CEO in 1993, serving in all three positions until 2003. Michael G. Morris (b. 1946) became chairman, president, and CEO on Jan. 1, 2004. On Jan. 1, 2011, Akins (b. 1960), was elected president; he became chief executive officer on Nov. 12, 2011. Morris continues as chairman. Sources: And There Was Light: The Story of American Electric Power, Its First 85 Years — 1906-1991, by William W. Corbitt, 1991; American Electric Power: A Century of Firsts, by Luke Feck, 2006; AEP Now: AEP History.